Martin Bencher has transported a scrubber, used in the oil and gas industry, from a factory in Malaysia to Thailand. 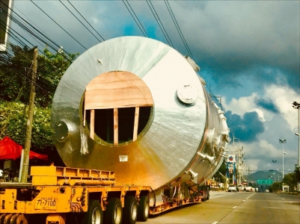 The Martin Bencher team in Malaysia handled the transport of the scrubber, which measured 13 m x 6.7 m x 6.7 m and weighed 15 tonnes, from the factory to Port Klang, where the unit was stored for over a month, awaiting site readiness. Once the site was ready, the scrubber was subsequently loaded onto a geared breakbulk vessel for transportation to Map Ta Phut. Upon arrival, Martin Bencher Thailand handled the Customs clearance and delivery to the project site, located 11 km away from the port. For the road transport, Martin Bencher Thailand had to raise phone lines and overhead signs to allow the unit, loaded on a dropdeck trailer, to pass.